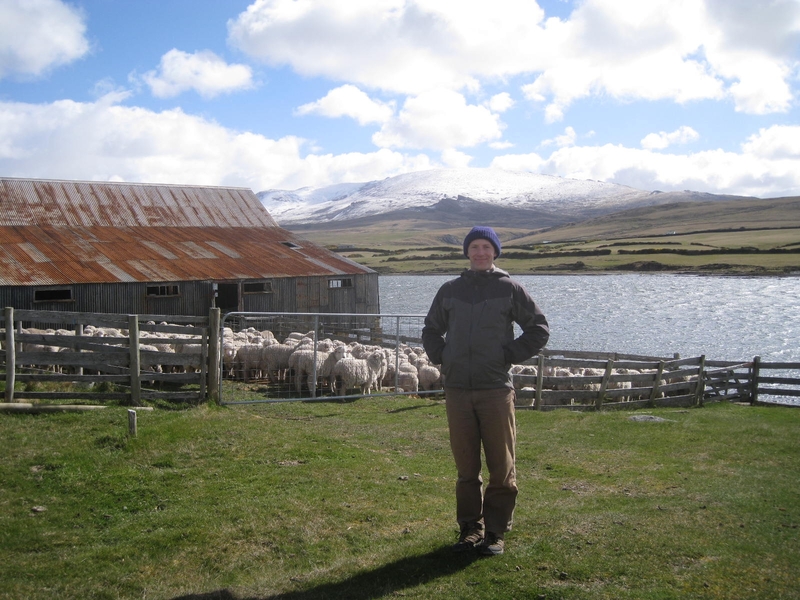 Brandon (pictured below) is studying Turkey Vulture flight behaviour and diet, along with farmer perceptions of vultures on the Falkland Islands for his M.Sc. research in the Conservation Biology graduate program at the University of Minnesota – Twin Cities. Brandon visited the Islands on three trips and lived there for ten months. 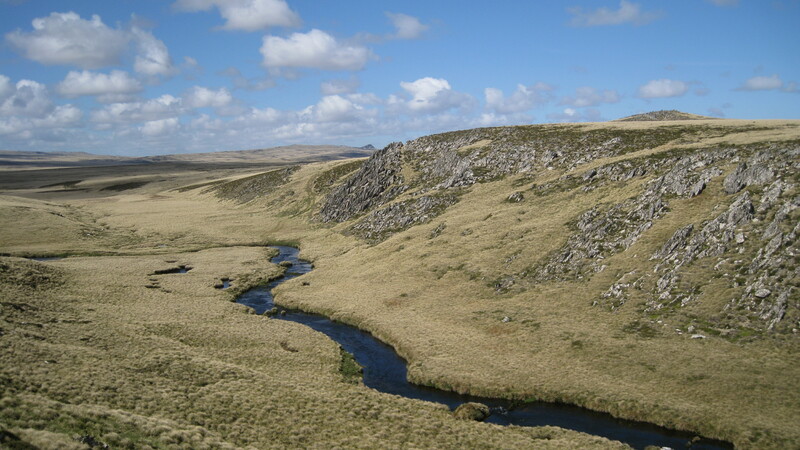 For those of you without much knowledge of the Falkland Islands, allow me to provide you an intro. The islands are in the South Atlantic, some 300 miles off Argentina’s Patagonian coast. The islands – think windswept, treeless, rugged, and rolling – are a mutton-lover’s paradise. At a ratio of about 200 to 1, sheep dramatically outnumber humans. (Let’s hope push never comes to shove.) The human population teeters around 2,600 and is a mix of multi-generation Islanders (primarily of British descent) and people from Britain, St. Helena, and Chile and, to a lesser extent, numerous other countries. Most people live in the one and only city, Stanley. The Falklands briefly came to international attention in 1982 when Argentina, which holds a long-standing claim to the islands, invaded. A bloody sea-, air- and land-war followed for a few months as British forces came down and liberated the Islanders. 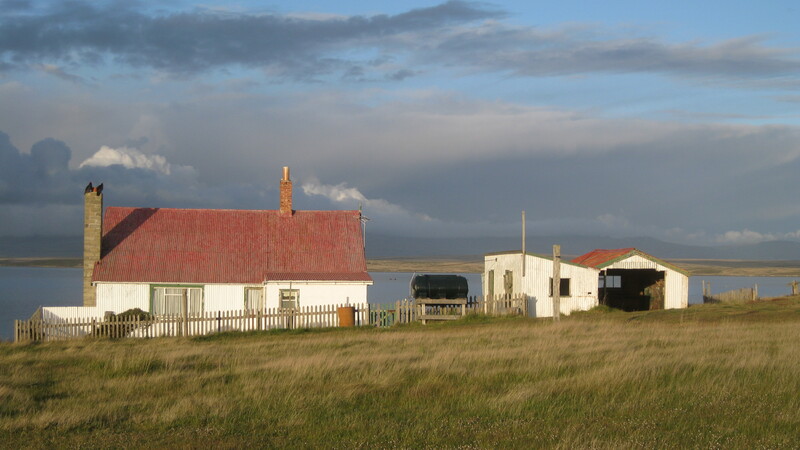 Relations between Argentina and the Falklands are still poor (Argentina refuses to give up its claim, or trade, or allow passenger flights to the islands from Argentine soil) and the war remains a sensitive and salient subject in the minds of the Islanders. Recently the islands have undergone substantial change. Wealth generated by newly developed fisheries (squid, toothfish) and a thriving tourism industry has powered much of the change. Additionally, a crash in wool prices caused a dramatic reduction in the number of farmers and changed the fabric of farm life. The large farms of the past have been divided into smaller farms that are typically managed by husband and wife teams. In the camp (as the countryside is called, from the Spanish “campo”), where communities once existed in all their eccentricities one now finds quiet farm houses (outfitted with television, phone and internet) dotted sparingly across the landscape. In pursuit of data on farmer perspectives of Turkey Vultures I travelled widely and met many farmers. I am a city boy with respectable outdoors experience, but a city boy nonetheless, an American, and a conservationist, and so am met with some scepticism by the farming community. Farmers initially probe to see if I possess a sense of humor, a test I usually pass by laughing heartily at the first joke about eating albatross for lunch. Happily I have spent many tea-drenched and cake-filled hours over the dining room table with farmers while they relate stories (remind me to tell you about the pet Turkey Vulture “Turkey,” rest his soul) and shared their culture as cake crumbs escape my mouth with each “Oh” or “Uh-huh” I emit. Mingling with farmers does, though, offer opportunities for social gaffes for a person of my background. One frosty morning my naiveté to the farming lifestyle became monumentally exposed when Shelley Nightingale, at West Lagoons farm, had to inform me that, no, as a matter of fact, ice cream does not come out of cow udders when milked in cold weather. A nice feature of many cultures around the world is the habit of dropping in to someone’s home unannounced. In Stanley this is a common custom. Within a few weeks of having nestled myself into a comfortable position in the islands, I started getting invitations – often from people I barely knew (for example the yoga instructor’s mother Sue extended an invitation from her yoga mat) – to “pop on over for a cup of tea”. The “when” of these invitations was conspicuously absent. After a few days I began to wonder if people were wondering about me. Wondering why that “Vulture Man” (how I am most commonly known) hasn’t popped on over for tea and biscuits. I was at a bit of a loss. I didn’t quite know how to proceed. Really, I thought, should I just show up at the doorstep of a person I’ve only spoken to once or twice? What if they’re in the middle of a meal, or watching a program they enjoy, or just aren’t in the mood for company? What should we talk about? What if we don’t have anything to talk about? Now, in truth, I wasn’t worrying about this to the point of neurosis, but I did have a few false starts. Off I go to Rex’s house… well, maybe they’re busy, I’ll just redirect myself to the store and pick up a Cadbury chocolate bar with fruit and nuts in it. Eventually, though, I brought knuckle to door. Rex, a New Zealander, and his Falkland Islander wife Trudy, were my first recipients. They welcomed me heartily, poured me a rum and coca-cola, and the conversation took an animal theme as we touched on creatures from mites to elephant birds, sting rays to mussels, and there was even an echidna in there somewhere. A possum or two also scuffled into our chat. The dislike of New Zealanders for the invasive Australian possum is legendary, and human feats of endurance and cunning have been undertaken to remove some unlucky possums from the realm of existence. We sashayed around this topic for a few moments. One fascinating tableau that emerged involves Rex charging off into the dark of night with his rifle in hand while his wife Trudy, following behind, tries desperately to keep up as she carries a car battery with wires running from it to power Rex’s headlamp. Another story: While Rex was driving down the road, he spotted a possum walking along a telephone wire. He thought he would “get the bugger” by blaring his car horn. The animal, surprised, lost its balance, but only swung below the wire and continued moving along the wire seemingly unfazed and upside down. My housing benefactor in the Islands and roommate Grant, who was then lead man at Falklands Conservation, possesses an identifiably British (dry) sense of humor. Grant is a soft-spoken class-act who has occasional outbursts of zany hilarity interspersed sparingly among (and contrasted strongly with) his more subdued quips. The playfulness behind his words is indicated not by a smile, but rather a glint in his eyes. In the town of Stanley on a winter night one notices the stars above – a rare observation in a capital city. I find it wondrous and conducive to contemplation that a starry sky has been taken away from hundreds of millions of people. How insidious has been the taking of our stars; we do not even realize these mighty bodies with their soft light, pondered and admired for millennia by our ancestors, have been removed from above our noses and exchanged in the name of progress. Those few that remain visible from a city street are impotent without the fraternity of their fellows. There is no outrage for outage, no cry for amends, it is simply accepted that a starry sky is an enjoyment relegated to places remote. As you walk home at night following a few laughs and beers at a Falklands pub, a glance up to the star-filled sky will remind you just where you are on the planet and how many miles separate you from the nearest continent. So with only a Tawny Eagle to show for our efforts after three long days of trapping, we still had work to do. We had a test unit that needed to get deployed, so I could decide which units we would be using during our July trapping session. We really needed one more bird. We had found the ultimate trapping spot: a quite cove surrounded by a small river and protected by trees, a difficult spot for mammalian scavenger to tell if a vulture was landing on a nest or on the ground. We had tried it a few times before and despite a great turn out of vultures, were unable to snag one. Today we would give it one last go before giving up and moving somewhere else. At 8 o’clock we dropped the meat, set up the nooses, and waited. The first birds to arrive were more Tawny Eagles. They stepped carefully around the nooses … aware but unconcerned. Their feet are tiny compared to a vultures, so the nooses generally shouldn’t catch them, but in trapping there are no guarantees. My heart was racing as three African White-backed Vultures came zooming onto the meat. They dropped from the sky with such speed that you could hear their wings against the wind, like tiny jet airplanes. The odds were slowly shifting in our favor. More African White-backed Vultures landed and slowly the squabbling started. As birds jumped around I could see the black loops we had set out slip over and off their feet. We just needed one to stick. Then, with an angry screech as one vulture attacked another, they all jumped off the meat. Everyone moved a few feet away except one bird. He seemed confused, hadn’t he jumped just like the others. We got one! We drove up and I nearly tripped as I came tumbling from the moving vehicle. The bird was quickly in hand and we put on the new unit, took some blood, and attached a wing tag. Kasine, who had joined us for the day, named the bird Ann after his girlfriend. The bird was surprisingly mellow, especially for an African White-backed Vulture, and only vomited slightly. Our scale showed the bird to be about 5.5 kg (nearly 11 lbs) – not bad for such a long distance mover. When all our work was through, the bird was ready for release. My heart was still in my throat from the adrenaline rush of the catch. I grasped the bird tightly around the neck and feet as I prepared for release. In my first vulture release, I had been terrified that the bird would turn around and come after me, but I knew better now. I set the bird down, releasing the feet first and then the head. With great effort (as always), the vulture ran forward and leapt into the air, wings flapping hard to lift its heavy body. Within moments the bird was airborne and off to its next adventure. Where would the bird go next? With the unit attached, we would know in a few hours. Trapping vultures is hard. It takes almost as much patience as watching vultures. After our amazing day of two birds at once, we had three days of nothing. 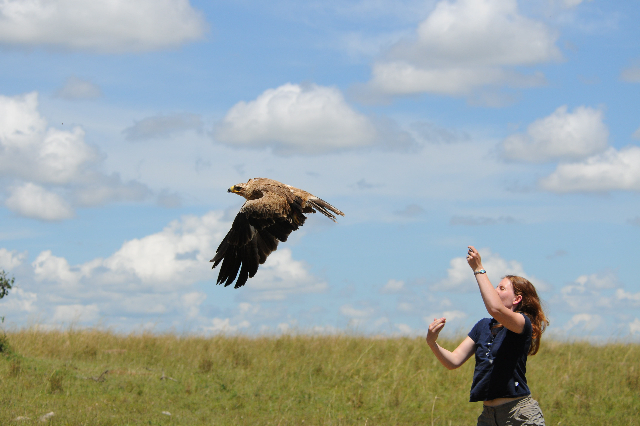 We caught one Tawny Eagle, which was interesting, but not quite what we were going for. The Tawny managed to snag itself on one of the nooses just as ten vultures were feasting around it – what are the odds? We quickly drove up to grab it. I carefully secured both feet before removing the noose. Wilson, who up until this point had only ever handled vultures, went to secure the head. He sort of pinned the bird to the ground. I quickly explained that with this bird we really didn’t need to worry about that end. You see when it comes to defense vultures and eagles are polar opposites. Vultures use their beaks – designed to quickly rip bone from flesh and with a long snake-like neck that is difficult to control – these are formidable weapons. The vulture’s talons on the other hand are incredibly blunt. All that walking around on the ground and they have basically filed their nails down. The talons are still impressively large, but not really sharp, so you don’t have to worry about them grabbing onto you with their feet. Alternatively the talons on an eagle are not only sharp, but they are also strong. Designed to kill, crush, and carry small prey, the talons can do some serious damage in just one grab. Having been “taloned” by a Red-tailed Hawk that we were trying to rehabilitate at the Cornell Wildlife Center, I can tell you it isn’t fun. The talons go right into your skin like tiny razor blades and can go all the way through your arm if you are particularly unlucky. In my case, the talons went in and out quickly which was fortunate as occasionally the birds can hold on. In any case, what this all means is the handling techniques for vultures and eagles are totally different. With a vulture we carefully secure the head first and foremost and can worry about the feet later. With an eagle, you want to have a good hold of the talons before you do anything else. Then (as was to Wilson’s amazement) you can calmly hold the bird against your chest (feet secured with one hand) and occasionally can even have the beak of the bird resting against your arm with no trouble. An eagle release is also a bit more dramatic as you can actually toss the bird up and let it take flight. captura en julio. Necesitamos un ave más. rendirnos y buscar otro sitio. generalmente los lazos no las atrapan, pero en capturas no hay garantías. nuestro favor. Llegaron mas dorsiblancos y empezó la comida. saltado como los otros. ¡Tenemos uno! nombró al ave Ann en honor a su amiga. estaba terminado el ave estaba lista para ser liberada. Mi corazón estaba todavía en mi garganta con la adrenalina de la captura. inicia el vuelo aleteando fuertemente para levantarse en el aire. What a day! Let me start from the beginning. I woke up this morning at 5 AM. It was day two of trapping. Day one had been less than successful and I was beginning to wonder if I had been crazy to think that I could trap vultures during the low season. You see, when the wildebeest come to Masai Mara in July so do the vultures. For three months, the park is overflowing with carcasses and scavengers. Trapping is made easy during this time, at least trapping African white-backed and Ruppell’s vultures, which are exceedingly common with upwards of 60 birds at each wildebeest carcass. 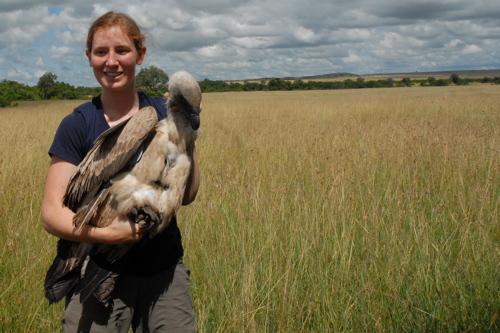 But trapping Lappet-faced vultures is tricky. Only a few birds come to each carcass, and they come late which means they are less likely to get trapped (since you have to put the trap down at the beginning and can’t go back and add it to a carcass without scaring all the birds), and they just tend to be a bit more cautious. So I had the “brilliant” idea that the low season would be the ideal time to trap Lappet-faced vultures with fewer African white-backs and Ruppell’s around. But after spending all of yesterday trying to trap with no success, I was starting to worry if I could trap anything this time of year. Nonetheless I awoke with a feeling of mixed panic and hope and set out to trap. My first stop was at Wilson’s house. Wilson, who helped trap last year and has helped throughout the project was obviously coming, but we had also recruited his brother (who also seemed to doubt our methods after yesterday), since you really need three people for stress-free trapping. I noticed a strange sound on the drive over, but didn’t really think much of it. Whatever it was it would be easier to fix it once I arrived than to stand around in the dark staring at the engine by myself. By the time I had reached Wilson’s house the sound was loud and he raced over to see what was wrong with the car. I had a puncture, but by the time I had reached the house the puncture had turned into a nice rip through the entire tire, plus a totally torn up tube. The spare was flat. So much for trapping, I thought, but Wilson would not be deterred so easily. One of his brothers who is a tour guide at another camp, happened to have his car by the house and he had a spare. Although it was a bit big, we put on the spare and were on our way. We had big plans for the morning and a nice spot picked from the previous evening, but that was impossible now. It was after 6, so we opted for a closer though seemingly less desirable area. When bad things happen, I always try to hope that they are just the beginning of good things. On our drive out Wilson told me that since we had gotten a puncture, we would probably catch a bird this morning. With an hour wasted on tire troubles we had to try a closer site for trapping. Fortunately with all the carcass observations we have done we know where the best spots are and had a new trapping zone picked out in minutes. Off we went. We put out the carcass – a head, organs, and 1 kg of meat. We put most of the nooses around the head knowing that was where the Lappets would be most likely to feed. The birds came down fast and we soon had 33 African white-backs, 2 Marabou storks, 2 Hooded vultures, and a White-headed vulture, but no Lappets. All the birds were hesitant, looking suspiciously at the strange loops that surrounded the carcass, but they were hungry. One bird finally went in and pulled the organs away from the nooses. The others quickly joined in and a feeding frenzy ensued. 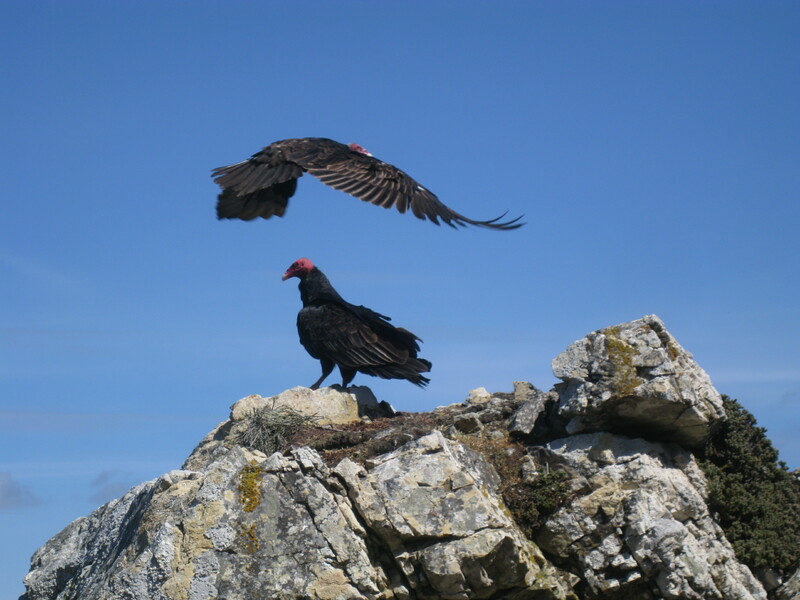 In the chaos, two Lappet-faced Vultures landed and stole a piece. As the number of birds around the food increased, a African White-backed Vulture managed to ensnare himself. Just as we started the engine to race over, he pulled loose. Now only the sheep head remained and one of the nooses was turned upwards. Just when it seemed unlikely any bird would approach again, a juvenile Lappet-faced landed. She started pulling at the head, ripping off pieces with her massive beak. Then she noticed something around her ankle … and so did I. Through the binoculars, it was clear that she had stepped into our trap, but wasn’t stuck. She reached carefully down with her beak and tried to remove the black loop. She looked like she just might be able to free herself when a pair of adult Lappet-faced Vultures landed on top of her. She suddenly switched into attack mode, spreading her wings and lifting her tail feathers. As the adult came in fast, she jumped backwards forgetting completely about her new bracelet. With her violent action to escape her conspecifics, she had inadvertently pulled the noose shut. We drove in quickly and within moments, the bird was in our arms and got a free ride as we moved her into the shade. After securing the GSM-GPS unit, we took a bit of blood to find out the gender (I just like to think she is a girl) and then we put on a wing tag. Weighing her was a bit tricky but we soon discovered that she was nearly 6.5 kg (not bad for a young bird). Then we set down the bag we had used to weigh her and let the bird out of the bag. She leaped out with great excitement as if this were her last chance for escape and she was off. Interestingly she decided to go right back to where her trouble began and landed next to the head, but after a few minutes she decided not to try her luck again and took off. We named the bird Lolly after one of the most devoted administrators at Princeton University (some of you will know who I mean). As Lolly the young Lappet-faced Vulture flew away I looked on with some sadness. Though I had just seen the bird closer than I would many of my study subjects, this might also be the last time I would see her. With their huge ranges we often don’t see the same bird twice. From now on, Lolly would be a blinking blue dot on a map and I would watch her devotedly and with great fascination, but also from a great distance. For a moment I wished I had spent more time with her. More time really taking in this magnificent creature – looking at her strange black “beard” of whisker-like feathers, admiring the soft juvenile fuss upon her head, feeling the fluffly downy feathers that would cover even her adult chest, or marveling at the long curved though surprisingly dull talons that had scrapped but not scratched me as we took some blood. But in the mad frenzy to get everything done and to get her back in the air as soon as possible, I had hardly bothered to look at her. 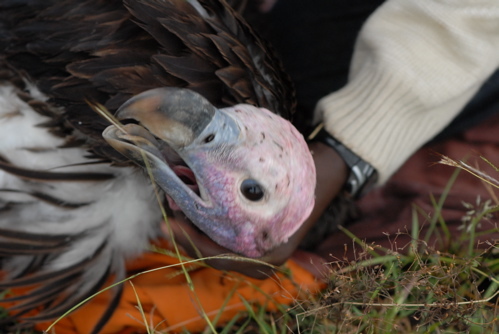 Nonetheless this bird would now teach us so much about her species – where Lappet-faced Vultures spend most of the year, how long they spend outside of protected areas, how far and how fast they do this and if we are unlucky, how frequently vultures get poisoned. Lolly will give us a vital first hand, up-close-and-personal look at where Lappet-faced Vultures go and what they need to survive. After catching two Lappet-faced Vultures in one day, I was exhausted but thrilled. The most difficult vulture to trap (at least of the three species I am putting GSM-GPS units) and we had gotten two in one day! In the evening we celebrated by dealing with the forgotten disaster of the morning – the tire. Then we dropped off the tire that had made it all possible with Wilson’s brother. Near his home a group of young boys gathered around. They had just started to celebrate their coming of age and decided to give us a show. Jumping and singing, they gave one of the cutest Masai performances I have ever seen with boys colliding and laughing, spitting and grunting in their miniature version of Masai warrior dancing. Back in my tent, literally as I sat writing this, a genet poked its head through the tent door – just a small unzipped patch at the bottom. I watched, amazed that it could somehow not see me despite being so close and in the glow my lamp light. Slowly the entire spotted body and long tail were inside the tent with me and it wasn’t until I said, “Hello” that the cat noticed me. Panic struck, and the genet raced back and forth, back and forth as if forgetting how it had gotten it. It clawed at the walls and I was just about to get up to open the door when it once again found its hole. Out it crawled in a mad dash back to the wild night. Elephant, hippo, and spiders, oh my! Today an elephant charged us. Usually this would be an event of great concern, but today it was just cute. The elephant was a baby, a pretty little guy. We could see him coming from a while off as he started his great stompy rush towards the road. By the time we were perpendicular to him he was coming fast, trunk up and trumpeting with all his little might. You could almost see the older elephants rolling their eyes at this foolishness. No one followed him or even acknowledged his distress. Everyone else stood ripping off pieces of grass and shoving them in their mouths as the little elephant came chasing after us. We stopped near him and he kept coming and coming – like a mini game of chicken. This probably felt safer on the driver’s side, where Wilson sat securely. The elephant was only a few feet from my door when it came to a stop. “What are you doing?” I chided him. His trumpeting stopped and he stood still a bit afraid and somewhat fascinated. I kept talking to him and he continued to stare at me curiously. I find talking to elephants always calms them or at least changes the mood – I often talk at charging elephants and it seems to change the identity of the vehicle in their eyes – no longer a hurdling mass but a sweet-talking entity. (Note: this technique does not work on rhinos ). When no one came to his rescue, the little elephant finally high tailed it back to mom, quite literally with his bushy little tail swung high in the air. Today we also got a closer look at two of my other favorite animals: a hippo and a jumping spider. The shy hippo was wandering through the tall grass, munching as it went. A huge scar was visible along one of his bulky sides and blood sweat, the strange red liquid (though not actually blood) that acts as sweat, insect repellent, sun screen, and antisepticm, streamed from his pores, covering the wound. We didn’t get a much closer look than that as he kept his distance from the car, but it was just nice to see one out of the water for once. 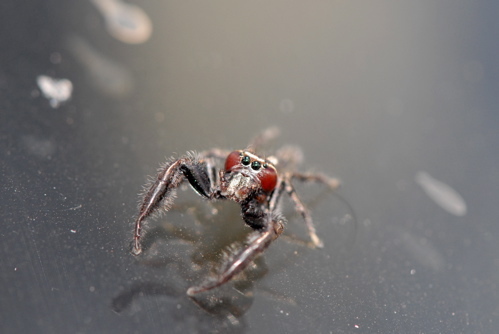 After lunch I found a gorgeous gold, red, and black jumping spider hanging out on our car. The two front legs were massive like a gorillas and they gave the spider’s robotic movements an almost crab-like feel. I gently positioned the spider with a bit of grass as I took a few photos. Every few moments the spider would swivel her head up to take a better look at me with her two great big eyes (she actually has more, but these were the only ones clearly visible). Jumping spiders actually see in color and have incredibly good vision. I wonder if she was as fascinated with my red hair as I was with her red tiny face. The golden markings looked painted and gave the spider an almost regal look. Before we left I bumped her off the car so she wouldn’t risk injury during transport.